Lisa’s out of town for Canada Day, so I get the keys to the blog! I also have the keys to her home, so stick around and maybe I’ll post embarrassing pictures from her fridge. A couple weeks back, Lisa showed us how to make a social media plan and I wanted to dive a little deeper into the “Set Your Metrics” section. As a business owner, you need to determine how to quantify buzz and as a service provider, social media marketers need to prove results. Below is a simple method for monitoring your social media metrics, which can help both parties prove real social media success. Quick note: I loved Marty Weintraub’s post about How to Build a Reputation Monitoring Dashboard and Duct Tape Marketing’s similar post on how to use Netvibes to track social media mentions. I stole inspiration from them after their original posts, but I wanted something more quantifiable. Our clients have to prove return to their executives and investors and spreadsheets make that process much easier. Everyone likes to see pretty charts that demonstrate growth over time! So, I hacked together this little process using a combination of Yahoo Pipes, various RSS feeds and Google Docs. Keep in mind there’s no limitation to what you can do if you use your imagination. To get started, you’ll need a Google account and you’ll need to know what you’re tracking. Are you a local business that wants to keep tabs on your reviews? Grab a location-specific feed from Yelp. Are you trying to build engagement on your Twitter account? Grab a feed that tracks your retweets or any #FollowFriday hash tags that mention you. Do you want to track product mentions in videos? Subscribe to an advanced YouTube search feed. Whatever you want to track, locate and build your feeds. Then drop those into a big list somewhere and we’ll come back to them in a minute. Now, go sign into Google Docs, if you aren’t worried about the Borg. Create a spreadsheet for your client, or if you are the client, create a spreadsheet for your brand, product, or competitor. How you segment everything is entirely up to you. There are a number of item types, but those listed above cover the majority of the social media items you’ll want to monitor. Moving forward, look at the other aforementioned item types. Besides “items title” there were also, “items url,” “items created,” and “items summary.” They’re pretty straight forward, “items url” pulls the URL of the individual entry. 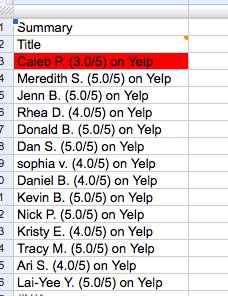 This means you’ll see the individual URL for each Yelp Review, tweet, video, etc. The third, “items created,” pulls the published date for each item. And the fourth, “items summary” pulls a summary, description or blurb for each item much like the contents of a regular old RSS feed that you display in your reader. Now that you know what you can display, setup the feeds for each tab and determine what you want to see. You can keep your spreadsheet as simple as this, just tracking mentions as they fly by. Or, if you’re reporting specific results, you can refine your feeds based on sentiment, online reputation management alerts, customer service inquiries, etc. Wil Reynolds over at Seer Interactive had an excellent idea to track link opportunities in delicious. As an agency or in-house social media marketer, you can take this a step further by privately bookmarking important action items. Then you subscribe to that feed in your spreadsheet under an URGENT ALERTS tab. You could also do something as simple as “change colors with rules” in Google Docs. You can make a rule that highlights Yelp reviews with less than a 4.0 rating or any other social media metrics you want to be notified of. Now that you’ve setup alerts, share the spreadsheet with your client or boss and they can log in at anytime to see if there are any fires that need to be put out. This is less invasive than email alerts and you have historical data to track progress over time. This isn’t a bullet proof solution, but it’s good enough to track engagement, popularity, brand mentions, your competitors, keywords and more.